Every year or so, there is a theme that God chooses to teach me. One year it was Biblical Womanhood, another it was Gratitude, yet another was Being Established. The past 2 years have been on the topic of Prayer. 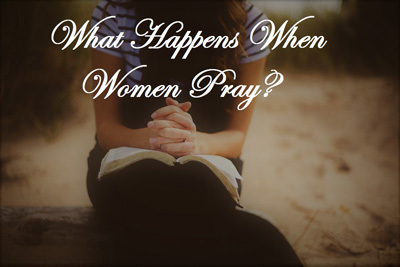 2) Evelyn Christenson’s book, “What Happens When Women Pray”. I found this little book at a garage sale, full of notes (so it must be good, right?). I’ve read it 4 times, and I learn something new every time. The Christian Missionary Alliance Church also chooses a theme every year, and their women’s ministry piggybacks on that. This year the Alliance Women’s theme is “MORE”. In my home church, our own Alliance Women are specifically studying how we can experience “MORE” power in prayer. I’m so blessed to be able to do this study with my own church family, and I am over the moon to see how God is going to use these women and their prayers in the life of our church. *A privilege* ~My husband’s grandpa taught me that. He called me monthly, until the day he died, to catch up and find out how he could be praying for us. I was so blessed by this man who was not a blood relative, but who loved me so strongly in word and in deed. *A responsibility* ~Did you know that it is designed by God as part of our relationship with Him, and the health of our prayer life is an indication of the health of our Spiritual lives? *A gift* ~Imagine if we could not go to God. Or imagine if we still, like the Israelites of old, had to go through a priest as a mediator, offering sacrifices, in order to maintain our relationship with God? When Jesus died for us, and conquered sin and death by rising again, HE became our mediator and now we can go directly to God in Jesus’ name. What a precious gift, and yet, it is one of the most neglected privileges and responsibilities within the Church Body today. The truth is that too often we do not give enough thought to how and when we talk to God. What’s more, many of us are not aware of the stumbling blocks that prevent God from inclining His ear to answer.